"Sunday, January 29, 1967 marked the major spiritual event of the San Francisco hippy era, and Srila Prabhupada, who was ready to go anywhere to spread Krsna Consciousness, was there. 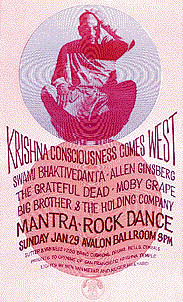 The Grateful Dead, Moby Grape, Janis Joplin and Big Brother and the Holding Company, Jefferson Airplane, Quicksilver Messenger Service -- all the new-wave San Francisco bands -- had agreed to appear with Srila Prabhupada at the Avalon Ballroom's Mantra-Rock Dance, proceeds from which would go to the local Hare Krsna temple. At about 10 p.m., Srila Prabhupada and a small entourage of devotees arrived amid uprorious applause and cheering by a crowd that had waited weeks in great anticipation for this moment. Srila Prabhupada was given a seat of honor onstage and was introduced by Allen Ginsberg, who explained his own realizations about the Hare Krsna maha-mantra and how it had spread from the small storefront in New York to San Francisco. The chanting started slowly but ryhthmically, and little by little it spread throughout the ballroom, enveloping everyone. Hippies got to their feet, held hands, and began to dance as enormous, pulsing pictures of Krsna were projected around the walls of the ballroom in perfect sync with the beat of the mantra. By the time Srila Prabhupada stood and began to dance with his arms raised, the crowd was completely absorbed in chanting, dancing and playing musical instruments they had brought for the occasion. Ginsberg later recalled, "We sang Hare Krsna all evening. It was absolutely great -- an open thing. It was the height of the Haight-Ashbury spiritual enthusiasm."